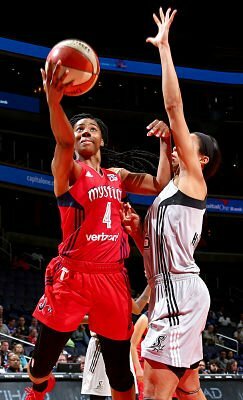 Tayler Hill scores two of her 15 on the day for the Mystics against San Antonio. Photo courtesy of WNBA/NBAE/Getty Images. 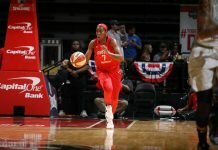 Washington, D.C. – A revamped Washington Mystics team wasted no time establishing themselves in their season opener Sunday, as they polished off the San Antonio Stars, 89-74. Former Chicago Sky star Elena Delle Donne was welcomed to the Verizon Center with a hearty ovation from the crowd and responded accordingly, shooting a blistering 72.7 percent from the floor and finishing with a team-high 24 points. Nine of the ten Mystics who saw action also scored, including Tayler Hill, with 15 points and Emma Meesseman with 13. Delle Donne, who requested a trade to Washington in February, was almost too excited to be playing so close to home. She picked up her fourth foul with 2:37 left in the third quarter, and had to take a seat. But this proved to be no problem. 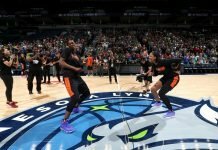 Meesseman and Tianna Hawkins took the reins for the team and reminded the rest of the league that they are still a force to be reckoned with inside. According to coach Mike Thibault, Meesseman only had about a practice and a half with the squad after returning from overseas, but that was not evident from the array of moves and the exquisite touch she displayed on offense. She also led the team in assists with five on the day. 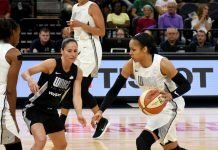 The Stars were without injured guards Moriah Jefferson and Kelsey Plum for the second straight game. Veteran Monique Currie tried her best to carry the team, with 31 points, but she was the lone double-digit scorer. The home team was a nightmare on the inside in general, winning the rebounding battle with 38 to San Antonio’s 23. Thibault was impressed with the performance of the Delle Donne, Meesseman and Hawkins trio, but said there is room for much improvement. Washington shot 6 of 19 from long range, with Kristi Toliver, Ivory Latta and Hill burying two each. The Mystics’ depth was a definite advantage, as was their stifling defense. And it was their starters from last year who played the biggest role in stopping the San Antonio attack down the stretch. “It was interesting that we made our best run for a stretch in the second half when we had our reliable standbys from last year, only because that group had played so much defense together last year,” Thibault said. “It’s going to take a little longer to integrate the newer players into that, into some of the things that we just instinctively do.” Washington’s defensive effort and balanced scoring kept them comfortably in control most of the afternoon. Stars coach Vickie Johnson said she was pleased at her team’s performance in the absence of two of its top players. Delle Donne is excited about her new squad. Thibault said the game was just the beginning.